Thousands of people in the Argentine capital, Buenos Aires, have gathered to demand the return of a missing witness in a landmark human rights trial. Jorge Julio Lopez disappeared nearly three weeks ago after testifying in the trial of a former police chief. Miguel Etchecolatz was later sentenced to life in prison for rights abuses committed during Argentina's military government between 1976 and 1983. It is feared Mr Lopez may have been kidnapped or killed for testifying. Several other key witnesses and three judges have said they received threats for their involvement in the case. The recent trials of security force members have re-opened old wounds, says the BBC's Daniel Schweimler in Buenos Aires. 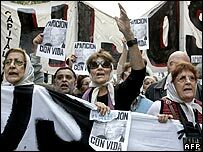 An estimated 30,000 people were kidnapped, tortured and killed during Argentina's "dirty war", when the military government persecuted suspected dissidents. When civilian rule returned to Argentina in 1983, many military officers were tried and imprisoned for the abuses. But subsequent civilian governments passed laws which allowed the guilty men to walk free. The Argentine Supreme Court last year overturned those laws, and recent months have seen new trials and the first killers put behind bars.